1. A whole in the ground into which you throw money. The The Wet Spot chlorinator was leaking today. I took it apart and knew almost immediately that it needed a new o-ring. Luckily, the pool supply store had it in stock. A nice young man helped me find what I needed. Unfortunately there is one other product that goes with the purchase of a new o-ring. Store Clerk: "Do you need any lube?" CJ: "I have some at home - for the treadmill" (nice recovery CJ). Can I just use that?" Store Clerk: "Depends - is it petroleum based or silicone based?" CJ's Brain: Petroleum based? That's the kind you are not supposed to use with condemns. But for treadmills? I don't think treadmills care. Store Clerk: "We sell it here." CJ: "Great, I'll take one tube." 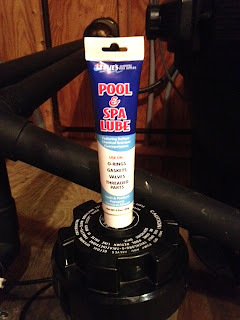 Then the other clerk chimes in telling me the all pool parts that could use a good greasing. Now I have two young men talking to me about lube. Please, unless I'm in a shop in Provincetown, I shouldn't not be having this discussion. Long story short, I paid for my products, went home, and fixed the chlorinator. Now if I could just get the dirt out of The Wet Spot, we could all dive in. you're killing me here, CJ. I have a weak constitution and all this talk of lube, wet spots and the like is making it difficult for me to breathe! To damn funny...but you're right. No one wants to jump into a dirty hole. Oh these comments are too funny. Love it!